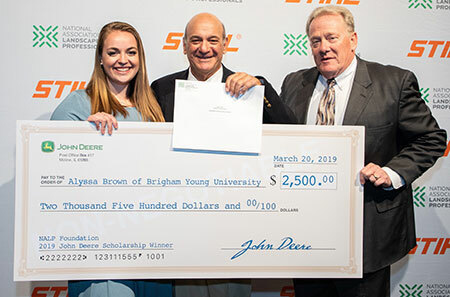 John Deere awarded Alyssa Brown from Brigham Young University (BYU) with the 2019 John Deere Landscape Industry Scholarship at the 2019 National Collegiate Landscape Competition (NCLC). 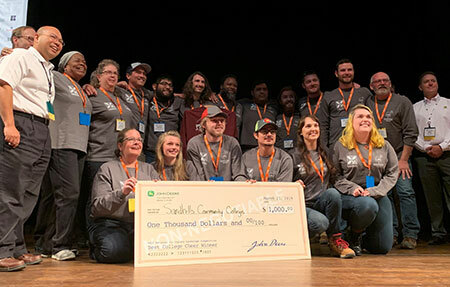 The NCLC was hosted by the National Association of Landscape Professionals (NALP) at Colorado State University in Fort Collins, Colo. During the NALP Foundation Scholarship Awards Reception, Alyssa received a check for $2,500, which will be used to further her education. A senior at BYU, Alyssa is majoring in landscape management and plans to pursue a graduate degree in environmental science. This year marked her fourth year participating in the NCLC, and she is the team captain of the BYU team. Also at the NCLC, John Deere awarded Sandhills Community College the Best Cheer Award and the $1,000 prize. The award was announced Thursday morning during the opening ceremony.